When I told you about the picnic loaf I made, I promised I’d tell you what I did with all the bread I pulled out from the center of the loaf. I know you’ve been waiting (okay, you probably totally forgot I even mentioned it), but this idea will have been worth the wait! At first, I considered making these meatballs, but then came along a chance to make this awesome, easy chickpea dish. This 5-Minute Chickpea Dinner is part of Bon Appetit’s Cooking without Recipes series, and I absolutely love it! I didn’t have peas on hand, so I just used red pepper lightly cooked in the same pan I was toasting my bread in. Sooooo good you guys. 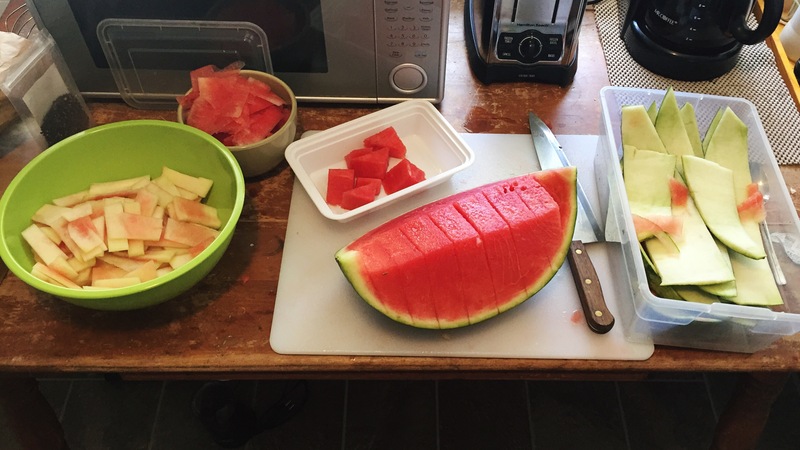 I was super happy to use every part of the bread I made, and–keeping with the spirit of Mottainai Grandma— I proceeded to use each and every part of the watermelon we had on our picnic, too. The white rind was used for Watermelon Rind Pickles, any pink or red shavings were used to make watermelon flavored water, the green rind was put in our compost, and we ate the inside just as it was. Using up the bread and the watermelon are two good examples of fulfilling number 48 on the 57 Things List: Never throw away edible food (my original post on the 57 Things Series is here!). What are some of your favorite ways to use every last bit of something edible?